Beth Henley was born in Jackson, Mississippi. Her plays have been produced internationally and translated into over ten languages. Crimes of the Heart (The Golden Theatre) and The Wake of Jamey Foster (Eugene O'Neill Theatre) were performed on Broadway. Off-Broadway productions include: The Miss Firecracker Contest, Am I Blue, The Lucky Spot, The Debutante Ball, Abundance, Impossible Marriage, and Family Week. Her play Ridiculous Fraud was produced at McCarter Theatre as well as South Coast Repertory Theatre. Ms. Henley’s The Jacksonian premiered at the Geffen Theatre in January 2012 to great acclaim. Robert Falls directed and the cast included Ed Harris, Bill Pullman, Amy Madigan and Glenne Headly. It was performed in 2013 Off-Broadway at The New Group. Studio Theatre produced the world premiere of her play Laugh in 2015. Ms. Henley’s new play Lightening had a reading at the Eugene O'Neill Theater Center’s National Playwrights Conference, summer 2018. 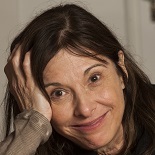 Beth Henley was awarded the Pulitzer Prize in Drama and the New York Drama Critics Circle Award for Best American Play for Crimes of the Heart. Other awards include: American Theatre Wing 1998 Award for Distinguished Achievement in Playwriting; Susan Smith Blackburn Finalist for Crimes of the Heart and Ridiculous Fraud; Richard Wright Literary Excellence Award 2000; New York Stage and Film Honoree, 2007; ATHE Career Achievement Award, 2010; Honoree William Inge Festival, 2017. Ms. Henley has the honor of serving as Theatre Arts Presidential Professor at LMU, Los Angeles. She is a member of The Fellowship of Southern Writers, the Dramatists Guild and the Academy of Arts and Science.